A Cartier pearl and gold fringe necklace, circa 1960, estimated at $1,500 to$1,800 and sold for $7,000. Imagine an event combining the spine-tingling intrigue of a spy novel,¬†the heightened excitement of a major sports event, and¬†the subdued exclusivity of a private club. For those in the know, the seating will have been reserved long in advance and it may be standing room only for the late arrivals. You’re at an auction of international calibre and about to bid on a piece of history, indulge in a romantic fantasy, fulfill a long-held dream, or simply make a¬†practical¬†purchase. Anticipation and actuality merge. Take a deep breath–the competition is about to begin. Welcome to a high-stakes auction. 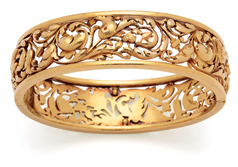 The extraordinary collection of vintage pieces might include an antique sculpted gold bangle with floral and foliate designs from 1890, featuring remarkable craftsmanship by French artisan Leon Gariod and scooped up by a savvy buyer who appreciates its timeless artistry. This piece is as wearable today as it was when first crafted more than 118 years ago.¬†A classic diamond riviere necklace circa 1875 and boasting 44 mine-cut diamonds mesmerizes its new owner, resulting in several covetous glances from captivated admirers. A novel ring circa 1760 that cleverly swivels to portray two miniature hand-painted portraits of British monarchs appeals to both the passionate historian and the most modern, eclectic fashionista. Chaumet, Cartier, Bulgari, Tiffany, Graff, Van Cleef & Arpels, Faberge, Patek Philippe, Breguet, and Chopard are just some of the revered diamond houses and elite watch makers frequently represented at auction.¬†The rarity or even trendiness of each selection can induce the international trade to outbid private collectors for important diamonds, signed jewels, and period pieces, which are always the coveted stars of the show.¬†Such signed pieces from international design houses encourage passionate bidding. 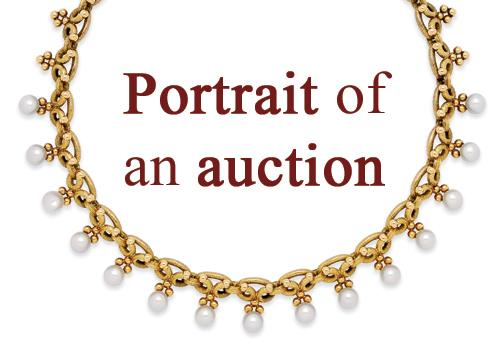 A Cartier pearl and gold fringe necklace motivates a winning bid that will garner ‚Äòoohs‚Äô and ‚Äòaahs‚Äô from all concerned. Tiffany & Co.’s stylish gold, diamond, and sapphire choker will also fetches an impressive price, reaching far beyond its initial estimate and demonstrating the esteem in which the house is held. An antique gold bangle bracelet by Leon Gariod, France circa 1890 garnered a winning bid of $5,000 at auction. 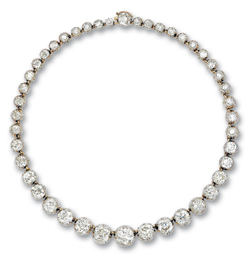 This antique diamond riviere necklace, circa 1875, sold for $140,000, well above its$60,000 to $80,000 estimate. The gavel fell on a $1,600-bid for this antique swivel portrait ring, circa 1760 (estimate $500-$600). Important diamonds command remarkable prices. The history, mystery, and magic of these three-billion-year-old geological marvels continue to fascinate buyers. An oval-shaped diamond weighing in at 3.38 carats entices one buyer to bid $90,000 on an estimate of $40,000 to $50,000, prompting effusive applause from an appreciative audience when the gavel falls.¬†And nothing excites diamond buyers more than fancies. A 4.22-carat intense fancy yellow emerald-cut diamond ring by Birks, circa 1938, charms its new owner into a winning bid of $60,000. Although diamonds, signed, and vintage pieces steal the show, watch collectors are also be enthralled by rare and beautiful finds. For example, sporty diamond watchmaker Chopard impresses several buyers with its unique take on fun, playful diamond accents. The ‚ÄòHappy Sport‚Äô model–with a pave-set diamond bezel enclosing three floating diamonds and a diamond snowflake motif–inspires spirited bidding. Are there treasures in your trove? Those familiar with the realm of the international auction house dealing in antique, signed, and modern jewellery, continue to be surprised by only one thing–the amazing discovery of the unrecognized treasures many people own, the full value of which they are unaware. Perhaps an estate piece is passed down and left to gather dust in a safe; an old engagement ring sits unworn and no longer relevant in a jewellery box; or a beloved grandfather‚Äôs pocket watch and fob chain–which seems so impractical to the young–is buried in a sock drawer and forgotten. Any or all of these pieces could prove to be extremely valuable when hammered down by the auctioneer’s gavel.